This is a wonderful undertaking and so very important as part of our heritage particularly so with the centenary of the Great War around the corner. Many of our churches, chapels and indeed village halls have in them individual memorial plaques placed usually by families of those killed. I believe we should try to encompass these in the project. There is a very good book on Devon’s War Memorials authors name escapes me, and my copy lent to “someone” so must track it down!! Would a circular to all Church/Chapel Wardens and /Councils be a useful way of trawling for support? Thank you for the comment Tim and for your interest in the project. There are indeed many memorial plaques inside churches, chapels and village halls and we aim to visit every single one, and we hope that readers of the blog will give us a heads-up on any obscure ones in unexpected locations. Please do pass on any info you can about the book. We are in contact with the Taunton rural dean and he has kindly compiled a list of contacts in the AONB region. We have also made contact with councils through our links with the Somerset and Devon Heritages services. We want to investigate further the possibility of getting more protection for the memorials at a county-wide level. I am Clerk to Pitminster Parish Council. 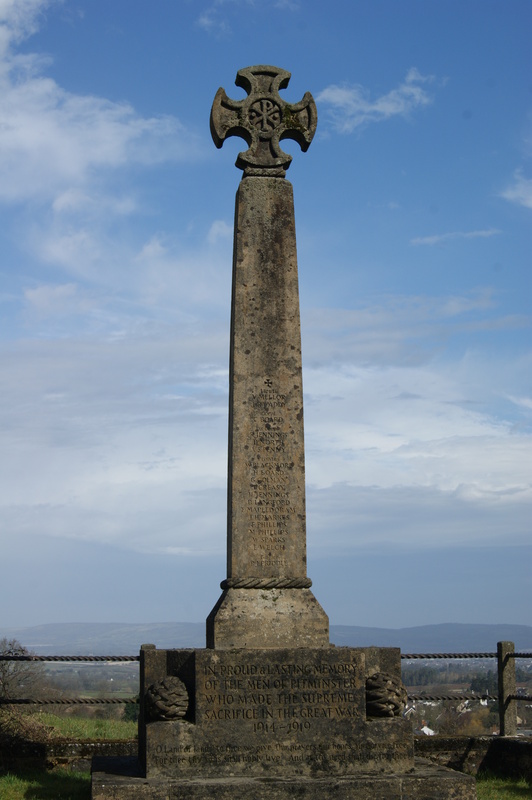 I have begun the formalities of obtaining a grant to aid the cleaning and renovation of the Blagdon Hill Memorial. Thank you for the update Richard.